But notwithstanding the implicit reference to a bible passage, the statement didn’t ring true to Louise Cox who in 1895, wrote a reply saying, “women writers marry [and] women musicians marry; why should artists be in a class by themselves?” Yes indeed, why should they, was the attitude of Lilian Westcott, a woman painter who believed that women had a right to compete with men in art circles. 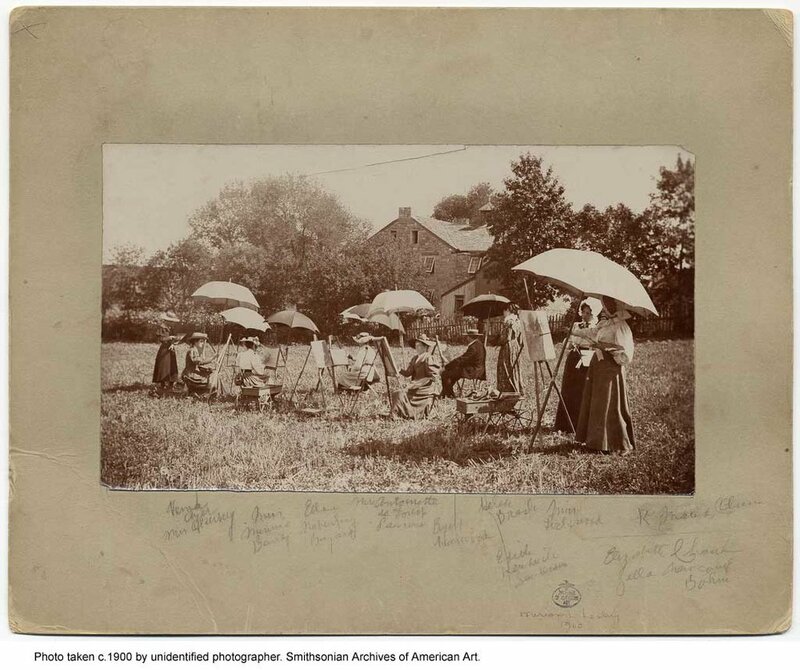 Miss Westcott continued studying under two great American teachers: Edmund Tarbell and William Merritt Chase, both of whom we might refer to as impressionists. Accordingly, the exceedingly talented Miss Westcott practiced her skills at painting and achieved high praise. However, eventually Lilian became Mrs. Philip Hale, and her husband was also a painter of high rank in the American art community. In spite of her own struggles to become recognized as a serious art maker, Lilian Westcott Hale developed into a highly successful impressionist whose husband supported her in every way. Not every woman artist gave up as a result of marriage. Indeed, there were some who valued their God-given talent so highly that they rejected marriage and chose to make art instead of babies. One of the most famous of these unmarried professionals was Mary Cassatt, a true American impressionist from Philadelphia who spent her adult career as an expatriate in France. 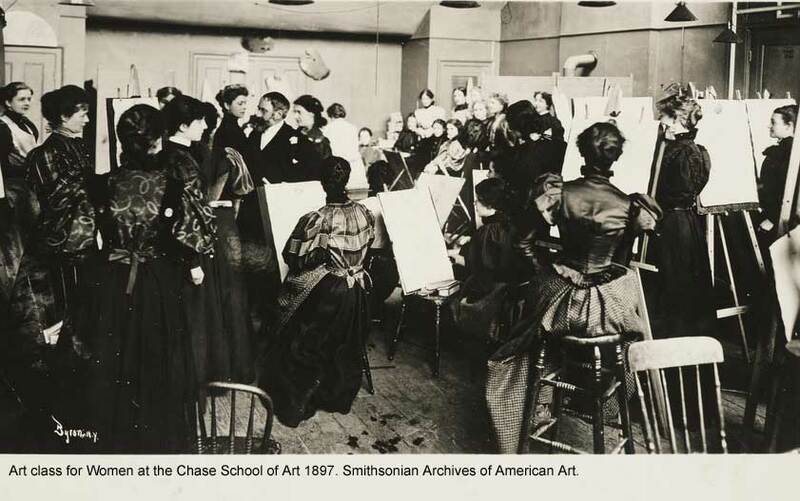 Standing out as a shining example of a truly successful woman artist, Cassatt was an inspiration to many young women hopefuls. 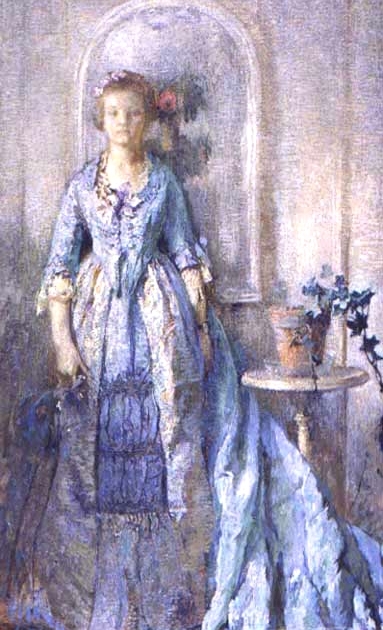 Lilla Cabot Perry was another successful painter whose marriage was helpful to her career. She traveled with her husband to Claude Monet’s home in Giverny, France where she participated in the American expatriates’ inauguration of American impressionism. While living next door to Monet, Perry was one of the few to receive the French master’s technical advice. Meanwhile Mr. Perry, a professor at Harvard, was enjoying what he called being an “exile” from Boston, and he sent back reviews of art exhibitions to the Boston Evening Transcript. Besides Monet, the Perrys befriended Pissarro and attempted to promote his works. Moreover, they helped to introduce French impressionism to Boston’s art scene by bringing back freshly painted canvases by both French and American impressionists. A perusal of paintings from this period will arguably reveal that a majority of pictures from the hands of women painters are figurative. Moreover, many of these focus on family life, including the activities of children and the mother and child motif made famous by Cassatt. Painters who achieved credentials in this genre were Marie Danforth Page, Gretchen Rogers, Sarah Wyman Whitman and many others. These subjects were considered “typical” of women painters at that time. But certainly not all were figurative artists, for some such as Harriet Randall Lumis were outstanding landscapists. In fact, Lumis' work was so highly regarded, she was able to make a living from her art. She was married but unencumbered by children as she painted marvelousscenes in and around Springfield, Massachusetts and elsewhere. Harriet Lumis’ career was proof that a woman could make a living from her art and help support her husband. With the triumph of modernism and abstract art, the traditional exclusion of women from academic drawing instruction was no longer an issue. America would produce outstanding women artists who were significant within an international milieu, such as Georgia O’Keeffe. She was one of the early American modernists promoted by her husband Alfred Stieglitz in his avant-garde Gallery 291 in New York City. In 1916 the unknown painter born in Wisconsin reportedly sent her drawings to a friend in New York with instructions to show them to no one. Georgia’s friend took the drawings to Stieglitz against her wishes. In another version of the story, O’Keeffe expressed how she would value Stieglitz’s approval. Stieglitz was more than pleased and her career was set in motion. In his photography and in her paintings, both artists shared a certain way of seeing. Later, in 1924, O’Keeffe and Stieglitz were married: he was sixty and she thirty-seven. As the 20th century’s art community began reflecting the liberation of women in America, its women painters were frequently praised as innovators. Not only did the fetters of male chauvinist culture fall away, some women exceeded their male counterparts a good deal. But I think it’s important to recall the many injustices experienced by women artists of a century earlier as a constant reminder that all Americans be given the full right to compete at every level, especially in art, a product of either gender.